A massive meteor hit the Earth's atmosphere, creating a giant shock wave that injured more than 1,000 people. On the same day, an asteroid half the size of a football field came within 17,200 miles from Earth. NBC's Tom Costello reports. A meteor flared through the skies over Russia's Chelyabinsk region early Friday, triggering an atomic bomb-sized shock wave that injured more than a thousand people, blew out windows and caused some Russians to fear the end of the world. NASA said it was the largest reported fireball since the Tunguska event in 1908 — an asteroid explosion that flattened millions of trees over 820 square miles of remote Siberian forest. Friday's event was witnessed by throngs of Russians in Chelyabinsk, a city of 1.1 million in western Siberia. Multiple amateur videos posted online showed the meteor’s flaring arc stretching hundreds of miles across the sky. Other videos from the scene captured the sound of a loud boom, followed by a cacophony of car alarms. One video showed the hurried evacuation of an office building in Chelyabinsk. Another resident described the meteorite's flash. "I was standing at a bus stop, seeing off my girlfriend," Andrei, a local resident who did not give his second name, told Reuters. "Then there was a flash and I saw a trail of smoke across the sky and felt a shock wave that smashed windows." The impact involved a 50-foot-wide (15-meter-wide), 7,000-ton asteroid that zoomed in from space at a velocity of 40,000 mph (18 kilometers per second), NASA officials said. They said the shock of atmospheric entry blasted the rock apart at a height of 12 to 15 miles (20 to 25 kilometers), releasing the energy equivalent of 300 to 500 kilotons of TNT. That's more than 10 times the energy released by the atom bombs that exploded over Japan at the end of World War II. In fact, NASA said its estimates were based on readings from infrasound sensors that were set up by the Comprehensive Test Ban Treaty Organization to detect nuclear blasts. The fireball hit just hours before a 150-foot-wide asteroid, known as 2012 DA14, came within 17,200 miles of Earth during an unusually close but harmless flyby. NASA officials said there was no connection between the two events. "It's simply a coincidence," said Paul Chodas, an asteroid researcher at NASA's Jet Propulsion Laboratory. NASA said the flash momentarily shone brighter than the sun — an assessment that was echoed by eyewitnesses in Chelyabinsk. No fatalities were reported, but Russia's Interior Ministry said about 1,100 people sought medical care after the shock wave. About 50 were hospitalized. Most of the injured were cut by glass from windows that were shattered by the blast's shock wave. More than 200 children at Chelyabinsk schools were said to be among the injured. Chelyabinsk resident Marat Lobkovsky's experience was typical: "I went to see what that flash in the sky was about," he told AP. "And then the window glass shattered, bouncing back on me. My beard was cut open, but not deep. They patched me up, it’s OK now." Another city resident, Valya Kazakov, said the brilliant flare and loud explosion caused older women in his neighborhood to fear that the world was ending. City officials told AP that 3,000 buildings in the Chelyabinsk region were damaged, including a zinc factory warehouse that lost its roof and part of a wall because of the shock wave's battering. Russia's Itar-Tass news agency said as many as 10,000 police were mobilized to aid in the recovery and remove debris. There were no significant disturbances to public utilities or communications, Vladimir Stepanov of the Emergency Situation Ministry told Itar-Tass. "No serious consequences have been so far recorded," Stepanov said. "There has been no disruption in the rail and air transport work." A search was conducted to find any fragments that survived when the space rock blew itself apart. A photo provided by the Chelyabinsk regional police department showed a 20-foot-wide (6-meter-wide) hole in the ice covering a lake near the town of Chebakul where some of the fragments reportedly fell. Astrophysicist Neil deGrasse Tyson, director of the Hayden Planetarium, speaks to NBC's Lester Holt about the meteor and asteroid that approached Earth on Friday. 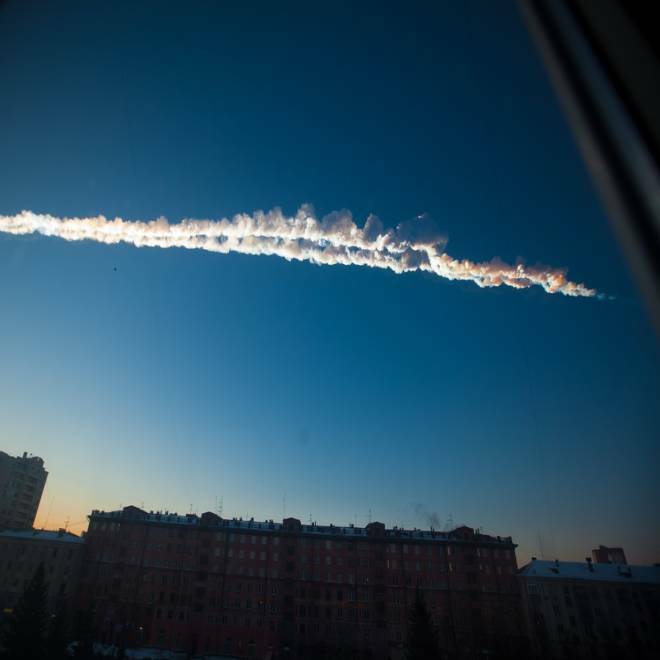 The shallow angle at which the meteor crossed the sky over Chelyabinsk contributed to the amount of damage, according to Margaret Campbell-Brown, an astronomer and physicist at the University of Western Ontario. “It’s like a sonic boom,” Campbell-Brown said of the shock wave. “A sonic boom from a plane can shatter windows, but this sonic boom was much stronger than a plane." It was a once-in-a-decade event, astrophysicist Neil deGrasse Tyson told TODAY on Friday. He explained that the meteor impact was the physics equivalent of hitting a brick wall. “When you hit a brick wall, you basically explode, and that’s what happened here, and it exploded in midair,” Tyson said. Russian Deputy Prime Minister Dmitry Rogozin said the incident showed the need for the world's nations to develop a system to intercept objects falling from space. "At the moment, neither we nor the Americans have such technologies" to shoot down meteors or asteroids, he said, according to the Interfax news agency. Coincidentally, experts from NASA and other agencies were at a U.N. space conference in Vienna on Friday to discuss strategies for developing an asteroid early warning system. A huge meteor flared through the skies over Russia's Chelyabinsk region, triggering a powerful shock wave that injured nearly a thousand people, blew out windows and reportedly caused the roof of a factory to collapse. This report includes information from The Associated Press and Reuters. The videos just keep streaming in from Chelyabinsk. You'll find lots of great clips and stills on this Live Journal page and this WBVF wrap-up. Thanks to my Twitter pals for passing them along.